Yep, I'm still around, just never here. Remember this kit? LilyAnn from A Fish Design hosted a speed scrap over at Scraps N Pieces tonight and I used the Play Time kit for my layout. I needed some orange and I knew where to find it! SNP blog train "Roll With It"
Here's a preview of my portion. Download the papers HERE and the elements HERE (shadows not included). Enjoy. P.S. That little smudge on the green paper has been fixed! Here's the "generic" layout I promised you using A Fish Design's Play Time kit. I included the alpha freebie I made and some FREE cardstock you can get coming soon at A Fish Designs' blog. Looking for the freebie? Go back to my last post to get it! 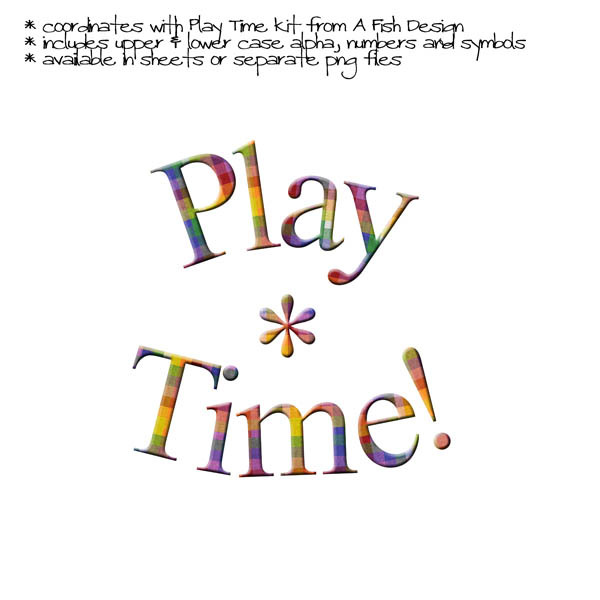 If you haven't checked out A Fish Design's Play Time kit, do so quickly before the sale price ends! You can pick up the pattern papers or just the elements if you like. Here's a freebie for you! or choose the full set of pngs here. It's Bits and Pieces time over at Scraps N Pieces and that means you can choose from several coordinating kits at the introductory price of $1.00 each. Here's what I did with some of the game elements from "Play Time" by A Fish Design. Check back soon to see a more generic layout with the rest of the pieces, but don't wait to check out the kit while you can still get the sale price! If you don't know who I am, what're you doing here? Please don't copy my stuff.. Watermark theme. Theme images by Jason Morrow. Powered by Blogger.